This is the second in the two-part series on the much-forgotten Malabar Struggle and stories of ghastly violence committed by the British in the region around 1921. I Sameel, the author of this article, also looks at why and how such incidents were ‘left out’ or/and ignored by our mainstream historians. 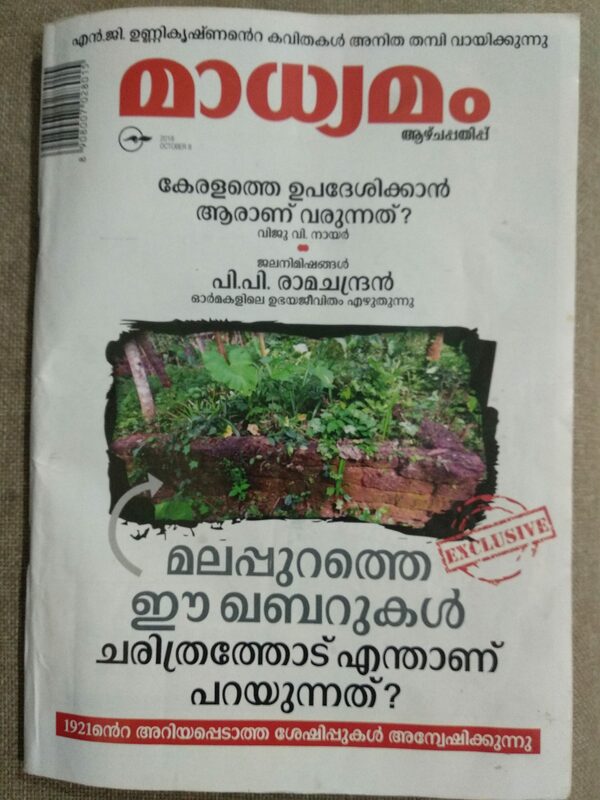 This article was originally published by Madhyamam Weekly on October 8, 2018. Eleven people have been buried in the grave dug in the yard of Areeppuram Parakkal Koyakkutty Haji’s house at Adhikarithodi Vattapparamb. His grandfather Areeppuram Parakkal Ahmedkutty Haji, his brother Moideenkutty Haji, Kuttirayeen, Marakkar and Konkayan Alavi, along with a man and his daughter from the Keedakkadan family are buried her daughter is the 11-year old girl mentioned above. Ahmed Kutty Haji’s daughter Ayisha was only four years old at the time, and she had detailed the incident to her son Yogyan Hamsa Master, who is a well-known Qissappattu writer and singer. Ayisha died last year at the age of 102. When all the members of the house had been forced out and the house set on fire, the women and children moved to the banana plantation nearby. It was then that the men were killed using rifles with less sound. Ahmed Kutty Haji’s neighbor and friend Konkayan Alavi was also caught along with them and shot dead, said the latter’s son Alavi’s son Alavi. One each in four generations of this family is named Alavi out of respect for Mampuram Syed Alavi Thangal, an Islamic scholar from Yemen who settled in Mampuram, now in Malappuram district. People used to frequent him for spiritual, religious and social advice. He was known for his anti-British stand in the 19th century. His tomb at Mampuram is considered an important pilgrimage site in Kerala. Mats were laid out in the laterite stone quarry in the yard of the house and all the dead bodies were kept on them and buried. The dead bodies of five members in the Kappoor family have been buried in the grave dug in the plot behind the GMUP (Government Mappila Upper Primary) School at Adhikarithodi. Kappoor Mundasseri Yusuf, his son Pokker, Kappoor Moosam, Ayamutti and Mammudu were buried here. None of the direct descendants of the dead live in the place now. Six people were buried in the grave dug near the house of Nanath Kuruvayil Hamsa. Those buried include Hamsa’s paternal grandfather Nanath Kuruvayil Moidu, his brother Kunjimarakkar and Madambi Kunhimuhammed. Nanath Kuruvayil Moidu was caught when sitting in his house reading the Qur’an with the belief that ‘they needn’t worry as they hadn’t been involved in anything’. When Moidu was caught by the army, his 14-year-old son Muhammed protested holding on to his father’s hand but was pushed away, said the latter’s eldest son Moidu (82). Before leaving, the army also set fire to the roof of the old house, which had been there in the place of Hamsa’s house. The Thiyya (a lower caste, now in the Other Backward Class category) family of Karattuparamban, who were their neighbours, was the first to help in the shocking time, said Moidu. The Thiyya family, that had to witness everything helplessly, hurried to put down the fire on the roof as soon as the army left. This can be seen as a small example of which side the lower classes including the Ezhavas (a lower caste, now in the OBC category) and Muslims supported in the Malabar Struggle. Five people have been buried in the grave dug behind the house of Mullappalli Ummer at Kannanthodu in Adhikarithodi Aakkaparamb. Those buried here include Athimannil Mammootty and one from the Vallikkadan family. Mammootty’s son Kunhimuhammed was dressed up as a girl to save him from the army, said his son Moideen (72). Everybody was forced out and houses were set fire. All the dead bodies were buried in laterite stone quarries. Four people have been buried in the grave dug near the ancestral house of Areeppuram Parakkal Zakariya at Konompara Cheeranganthodi. They are Areeppuram Parakkal Kunjeen Haji, his son Ayamu, daughter Kadiyamu and son-in-law Nanath Innyali. A sick Kunjeen Haji had asked his family to take him to a sideway which the British may not notice. But the family expected the army to let him free as he was sick, said Fathima, granddaughter of Ayamu. Ayamu’s son Vappu Haji (who was 14 years old then) and friend Nanath Kunjalavi Haji were dressed up as girls and kept along with the women to save from the army’s cruelty. A person from the Vallikkadan family lay seriously injured for four days some distance away. Bappu Haji, who was a boy then, gave him water to drink. But all the water he drank came out through his large intestine. Having nobody to treat, he died there on the fourth day and was buried at the same place. As time passed, his grave is no more there. Two persons from the Narippatta Kappoor family have been buried in the grave behind the marketplace at Konompara. Narippatta Kappoor Ahmed and his son Pokker were shot dead. Seeing the army set fire to their house, they both ran off and hid behind a heap of dried leaves from where they were shot. They were buried there itself. Another son of Ahmed named Kunjalavi was caught by the army and exiled to the Andaman Islands. Ahmed’s grandson Alavi (son of Moideenkutty) lives here with his family now. One person has been buried in the grave in the courtyard of Nambankunnan Muhammedali at Melmuri Valiyattappadi – his great grandfather Alavi. The army caught him when he was peeping out through the tiny window saying nobody would take him away as he was very old. When he was sure to be shot, he took ablution and stood facing the qibla (direction of the Holy Ka’aba in Makkah), said his nephew Moideen (87). He recalled that in his childhood there were many coconut palms without head as the top portions had been blown off due to the cannon firing of the army. Alavi’s deadbody was buried by the women of the house at night, and the grave is only two feet in depth. Two persons from the Kappoor family were buried in the grave in the courtyard of Kappoor Usman’s house; they were Kappoor Itheerumma’s father’s brother and grandfather. Itheerumma who had no children died recently. They are also the brother and son of Ismail aka Ithelu, grandfather of Kappoor Usman. Ithelu was caught by the army and jailed at Rajamundhri in Andhra Pradesh where he died. The army had set fire to their ancestral house nearby. Usman’s father Muhammed Haji recalled getting bullets from the wall when the house, which had been partially burnt, was brought down recently. Four people have been buried in the grave dug near the house of Madambi Ubaid, behind the Central Lower Primary School at Melmuri Muttippadi – Madambi Kunjaramu, Madambi Mammunni, Kaderi Moosa Haji and Cherkkadan Moideen. They were shot dead at the verandah of the ancestral house of the Madambis nearby. This house too carried the traces of bullets penetrating the wall till recently when it was repaired. Kaderi Moosa Haji’s son Mammudu Haji bought this piece of land and donated as Waqf to the masjid at Alathoorpadi nearby in the name of his mother Iyyathukutty Hajjumma, so as not to lose the land, informed writer Umar Melmuri, a descendant of the family. Some people from the Perumkollan caste had accepted Islam and lived at Vaishyarthodi near Thattanthodi. Three among their later generations were shot dead by the army, and their house set on fire. They were then buried near the well of their house, and the grave was not well protected, said PT Muhammed Master of Alathoorpadi. The reason for the British to target Melmuri and Adhikarithodi specifically is the influence that Ali Musliyar, leader of the Malabar Struggle, had in the region. Ali Musliyar had run his Dars (religious education centre) in the mosque at Melmuri Podiyad Parammal and later in the mosque at Melmuri Alathoorpadi. He was there for three years, and so quite naturally, had a considerable number of disciples in the area. Palakkamthodi Aboobaker Musliyar, Congress Khilafat leader in the Kozhikode taluka who was an important personality in the Malabar Struggle, was his disciple at the Dars at Podiyad. (AK Kodoor – Page No 98). Many leaders of the Malabar Struggle were young scholars who were the disciples of Ali Musliyar. Though carried out in the name of eliminating the Pookkottur gang, the real aim of the massacre was terrifying the common Mappilas who were not directly part of the Struggle. Those including Nanath Kuruvayil Moidu who was massacred had believed that the army wouldn’t attack them as they had not taken part in the struggle. By killing them, the army sent a clear message to the Mappilas to either be a British-supporter or face death. The silence of the thousands of slaves drowned deep in the Atlantic Ocean on their voyage is louder than the voice of the slaves who were taken from Africa to America crossing the Atlantic, observes Afro-American writer Saidiya Hartman in her first book ‘Scenes of Subjection’. She says that the unheard voices of the thousands of slaves drowned in the sea should have been the archives instead of the available and oral historical remnants. In a way this points towards the crisis of archives. Using the hypothesis of ‘the silence of archives’ put forward by Ms Hartman to learn the Melmuri-Adhikarithodi massacre, the question remains as to what tools our history owns to record the 200 people without any remnants, beyond the graves of the available 40 people. Is a historiography still possible to acknowledge their silence? Those who have drowned in history thus without any address remind us that the crisis of history is not its voices but its silence. If the Malabar Struggle is the silence in our national history, these graves are the silence inside that silence. This important part in the Malabar Struggle reminds us the importance of probing into the history of those not present too, beyond the written, oral and data/artifact histories.